John Torringion was a well-known actor. It was his clever acting that enabled him to get revenge. Ruthless thieves had murdered his mother and sent his sister to the hospital. Now, John Torringon wanted revenge! Torrington’s mother had died of the shock and the beating administered by the callous thieves who had entered her home during the night; his sister was in the hospital as a result. Torrington himself had only four fingers on his right hand — a souvenir of an accident when he was a boy. The inspector’s eyes rested on the hand absently. At ten sharp, John Torrington was there. In the Detective Bureau, Inspector Sheldon introduced Nick Trout, a slender man with an unusually fine complexion and light blue eyes. “You can use the room next door if you wish to talk privately,” Sheldon suggested. They went into the next room. “Four fingers!” the actor said thoughtfully. But he was half-smiling, a look of amusement in those cold blue eyes of his; he met Torrington’s boring glance without flinching. He glared at Trout; Trout frowned but said nothing. And the look on Torrington’s face was such that even Trout, hard character though he was, finally turned away. “I’ll give it to you in writing.”Torrington took out a memorandum book, scribbled rapidly, tore out the sheet and handed it to Trout. “I gotta play square with you … you’re a friend of the inspector’s, aintcha? My flat is at 302 East 116th Street — you see how fast the cops got me when they wanted me.” He went out. Torrington went into Sheldon’s office and told him what he had done. The inspector appraised John Torrington’s well-known features and six feet of good-looking masculinity with a quizzical smile. “You couldn’t shadow him for a block without his spotting you! At seven o’clock in the evening, the shabby-looking elderly man saw Nick Trout enter the house at 302 East 116th Street, and although he waited outside of the house until after midnight Trout did not come out again. But the next morning at ten, Trout issued forth, looking as spruce as a salesman in a swell clothing shop. Behind him and on the other side of the street, a fireman in uniform strolled along. Trout went down in the subway, walked across town, and went upstairs in a building on Second Avenue near Seventh Street. He came down, grabbed a cab like a business man in a hurry, and Torrington had a job then to find another cab and follow him quickly enough not to lose him. Trout got out in front of a poolroom on Christopher Street, went inside. He came out almost an hour later. Torrington caught sight of him at once, and followed him to the subway. Trout got off at the Fulton Street station, and walked straight to a building in the jewelry district on John Street. Torrington followed him to the second floor, and lingered on the stairs, watching as Trout paused in front of one door and studied it. Trout hesitated, turned and threw a quick look at Torrington, who seemed to be on his way upstairs. Then, without going in, Trout descended to the street again. An hour later came the disappointment. Trout entered a hotel — and disappeared! Torrington waited for two hours; during that time he wandered through the hotel lobby half a dozen times, and finally discovered the door on the side street, through which Trout must have exited unseen. Trout did not go home that night, and his door was still locked the following morning at seven, when John knocked. Baffled then, the actor called Inspector Sheldon on the telephone, and Sheldon sent out his emissary to bring Nick in. The officer came back with the report that no one in the neighborhood, and none of Nick’s intimates, knew where he had gone. Torrington thought of the office door on the second floor of the house on John Street, at which Trout had gazed with so much interest. He went back to his apartment and changed his costume. It required every bit of skill John possessed — it was one thing to dress up and fix up to appear on the stage, and quite another to make up for the street, where his disguise would have to stand the light of day. He went downstairs to look it up, but there was no “Prentice & Co.” in the telephone book. A new firm? “Dunno! Mebbe you kin do something, mebbe not! All depends!” The farmer stared at the jeweler, noted particularly his hands. There were the usual five fingers on each. “Okay, okay — no offense!” The jeweler sat down again. “You couldn’t sell it to me for a dime! Say, have you got a diamond ring for a bargain? This size?” He held out a piece of string. The gray eyes behind the spectacles read the self — condemnation the jeweler was heaping on himself as he came forward. Silently Prentice took off his glasses and wiped them with an air. Then, with reverence, he took a blue plush box out of the small safe in the office. “Here’s a beauty! Three carats — a flawless blue diamond — platinum setting — there’s real class! Here, take a peep through this magnifying glass! The farmer examined the ring without much enthusiasm. It was not part of the loot taken from the Torrington home. “Don’t give a durn about no Four Hundred — it’s what Lucy likes,” he grumbled. Bunting drew forth a large, greenish-black wallet, shabby but well filled., Prentice’s eyes glittered at sight of it. Prentice swallowed and drew a long breath. “What’s your hurry, Mr. Bunting? Sit down — here, have a smoke.” He handed the farmer a cigar; the farmer put it to his nose, then said, “Thank ye,” as Prentice lighted it for him. “I should have known you’re the kind of man who has the money and doesn’t care about appearances,” Prentice said. The farmer was dizzy, all right. It took all his artistry to suppress the surge of excitement, hatred, eagerness, that swept him. He succeeded in looking only mildly interested. “I allus thought necklaces was made outa pearls,” he said. “I was thinkin’ of rings,” Bunting protested. Prentice fell into a reverie, and the farmer waited. He went out, and Torrington began to wonder what crooked, devious scheme the jeweler was hatching. It might all be on the up and up, and even if it were an attempt to swindle a too-trusting farmer, there might be no connection with the Torrington robbery. Torrington was the one which had belonged to Torrington’s mother, then Prentice was either one of the murderers, or a fence. Murder may become a habit. He was going to Prentice’s home … a micky finn, a blow from a blackjack, even a bullet, were all little contingencies not to be dismissed from consideration. Prentice might feel that it was unnecessary to trade jewelry for money when he could have both. Of course, it was quite possible the necklace might not be the one. Nevertheless, Torrington stepped to the telephone and dialed Police Headquarters. Sheldon was out, but he talked to an assistant in Sheldon’s office. The Prentices lived in a furnished apartment on the ground floor of a house in West 91st Street. Apparently Prentice had telephoned they were coming. A shapely blonde maid opened the door, and in the living room, Mrs. Prentice greeted Bunting effusively. She was a female benison as she hovered over Prentice, her large, calcimined face exuding hospitality, her greenish-brown eyes literally beaming. No make-believe beam, either, reflected Torrington. The thought of that wallet made her amiability both spontaneous and real. The maid brought cocktails, and then Prentice disappeared for a few minutes. He came back with the necklace. He said, “There it is, Bunting — what do you think of it?” And held it up. It would have surprised him to know that his guest knew more about that necklace than he did. It would have surprised him if he could have read Torrington’s mind that instant, and seen the red rage that swept the actor’s brain, that curved his fingers into claws which literally itched to grip the jeweler’s throat. But looking at the farmer, Prentice saw nothing unusual. They sat down at the table, and the blonde maid brought in the fruit cocktail. There was something about that blonde maid which attracted Torrington’s eye, and watching him as his eyes followed her, Prentice winked at his wife. When the soup came, Bunting hitched his chair forward, arranged his napkin under his chin, and picked up the wrong spoon. Watching covertly, the actor saw Prentice cast a droll look at his mate — and stare in surprise. Torrington’s glance flashed to Mrs. Prentice. She was staring at him, and the blood left her face, leaving it mottled. Torrington could not understand what had frightened her. She was looking at his hands; Prentice’s gaze followed his wife’s. Then Torrington realized. What a fool he’d been! His hands were smooth and white, certainly not the hands of a farmer. He had forgotten about them in making up. But his swift glance at Prentice, at the panic in the jeweler’s face, told him something else — something that flashed through his mind with the recollection that Nick Trout had only four fingers on one hand — his left hand, to be sure, whereas Torrington’s four fingers were on his right hand. But these crooks might be thinking he was Nick Trout — Trout had a reputation — not many knew him personally, but every crook had heard of him, according to Inspector Sheldon. They thought he was Nick Trout! Something was impending; Torrington could tell by the sudden stillness. Poor actors, both these crooks — they couldn’t hide their fear. Clara Prentice’s face had become alrnost green under her paint. His hand darted into his pocket; when it appeared, a black muzzle pointed at Prentice. Without even waiting to be told, Prentice raised both hands high. She obeyed. Then he saw it! A finger was missing from her left hand! The short robber who had broken into the Torrington home that terrible night! Mrs. Prentice in male attire! He was sure Torrington was Nick Trout. 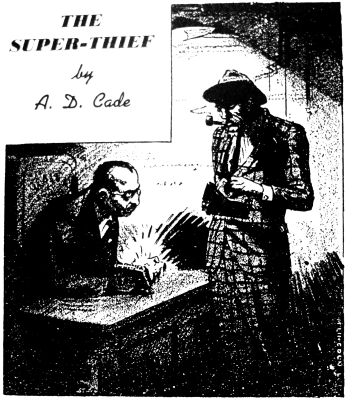 Evidently he had heard of the super-thief, but had never seen him. The actor glared at him. A subtle expectancy in the attitude of the precious couple puzzled Torrington. Some sixth sense warned him of danger. Torrington dared a swift glance over his shoulder. There stood the maid, two feet away, pointing a gun at him. She could not possibly miss. He dropped his weapon and elevated his hands. Stupid of him. Anybody working in an establishment of thieves like this one was worth watching. He had completely overlooked danger from the blonde maid. That one glance told him that she was dressed for the street and the look in her light blue eyes convinced him that she could not be trifled with. He obeyed, and she walked over and picked his weapon from the floor. Then she turned her attention to Prentice. Apparently the order astonished him, but he obeyed promptly. She took the necklace and thrust it into her blouse. Mrs. Prentice shrieked suddenly, “Betty — wait for us! We’ll go along with you!” And she made one impetuous step, overturning a chair in her haste. Betty took one long stride toward her, and instantly Mrs. Prentice froze into frightened silence. Reaching behind her, she turned the knob, stepped back and vanished, closing the door softly. He rushed toward the door without waiting for a reply. With two long bounds the actor overtook him. He smashed Prentice to the floor with a solid punch. There was a banging on the door; then it opened wide. Betty came in. Behind her was the propelling power of a strong — armed plainclothesman; behind him came two others. Betty’s blond wig was awry, disclosing a shock of brown hair, darker in color than the wig. One of the officers put handcuffs on him. “Nothing doing — got to leave everything as is.” A detective interposed between them. “Take it easy, Mr. Torrington,” a detective said soothingly. Another put a detaining hand on Torrington’s shoulder. “Like you pick your guests,” she shrilled back at him. Nick stood there grinning malevolently at them. He didn’t have their reason for worrying. All he could be accused of was trying to rob a couple of other crooks — and he might beat the rap by turning state’s evidence.